Foreign Affairs Minister Chrystia Freeland says a peaceful transition of power is “absolutely” possible in Venezuela, even as embattled President Nicolas Maduro digs in his heels and opposition leaders refuse to rule out military intervention. Foreign Affairs Minister Chrystia Freeland said a peaceful transition of power is "absolutely" possible in Venezuela, even as embattled President Nicolas Maduro digs in his heels and opposition leaders in Venezuela refuse to rule out military intervention. "I think that peaceful transition is absolutely possible. It is not only possible, it is essential and that is what Canada and the Lima Group are working for," Freeland said in an interview with CBC News Network's Power & Politics. 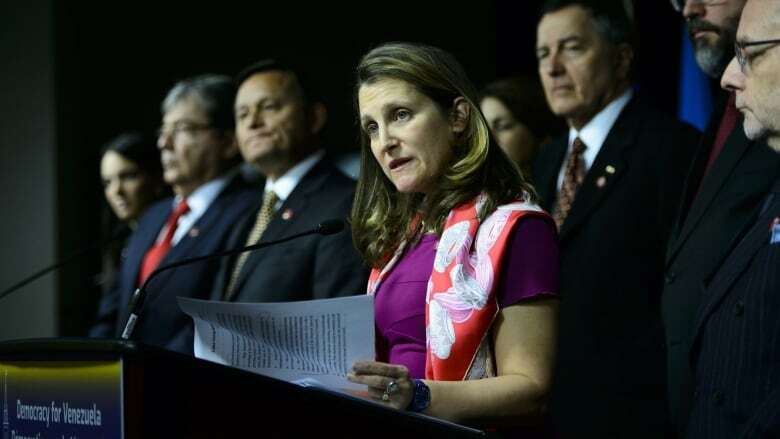 Freeland's comments come after the Lima Group concluded a day-long emergency summit in Ottawa by proclaiming Venezuela's opposition leader Juan Guaido a full member of the multi-nation group while reiterating its call for a peaceful resolution to the crisis. The group also called on the Venezuelan national armed forces to back Guaido. Despite a couple of high-profile defections, Venezuela's national armed forces have largely, to date, continued to back Maduro. The military's continued backing of Maduro doesn't seem to shake Freeland's conviction that a peaceful resolution is possible. "What history shows, is once a leader of an authoritarian regime discovers that there are no alternatives, that is when you see the regime fracturing and that is when you see democracy restored and I am absolutely confident that is what will happen in Venezuela," Freeland told host Vassy Kapelos when asked what gives her hope a peaceful transition is possible. The Lima Group's opposition to military intervention stands in stark contrast to the rhetoric coming both from the U.S. and from opposition leaders in Venezuela. In a CBS interview that aired Sunday, U.S. President Donald Trump said American military intervention is still an option on the table. And today in Ottawa, Venezuelan opposition representative Julio Borges refused to rule out military intervention, saying he is "pro any measure that could bring Venezuela liberty." Former Canadian Ambassador to Venezuela Ben Rowswell highlighted Canada's opposition to military intervention as particularly important. "Transitions to democracy cannot be made at the barrel of a gun. They are done by the will of the citizens of the country, free from any kind of threat and free to make their own choices, not choices made by foreign soldiers," Rowswell told Kapelos. "I think the [Canadian] government's shown some real backbone in their approach to Venezuela," said Rowswell. "This is the first time, and I was a diplomat for 25 years — the first time that I've seen Canada openly disagree with the United States on a major issue in Latin America." On what may break the current stalemate, Rowswell said that Maduro is a "bitter ender." "He is likely to stay in power as long as he possibly can. So it really will depend on others in Maduro's administration and in the security forces abandoning him and not he, himself, deciding to run off into the sunset," said Rowswell.